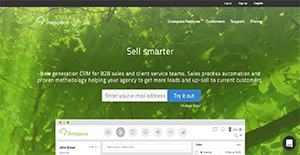 Livespace is an innovative, new generation CRM that paves the way for intelligent sales and client support. The application also serves as a platform for users to rigorously take control of the sales processes. This enables them to achieve enhanced results until they find a method that works best for them. With Livespace, every company is afforded the ability to customize the application according to their set processes. This lets them mold the software to the way they work so that it can efficiently serve their business needs. Moreover, Livespace provides actionable insights to its users. The intuitive CRM platform offers information about sales and performances and other metrics in real-time. With such data at hand, users are able to make better-informed decisions. With Livespace, sales representatives are armed with a CRM that provides them with a ready-made sales funnel that can assist them in streamlining their operations. With that, they are able to increase their chances in winning over new clients and retaining old customers. Livespace assists companies in identifying which customers are the right ones for them. The application has features that enable businesses to set benchmarks and segmentation settings to filter potential customers and new leads that come in. Doing so lets them focus more on more profitable clients. Executives and managers can set goals for their departments or teams to reach within a certain amount of time. On top of that, Livespace aids them in tracking completion progress of each objective. By keeping an eye on such things, leaders are able to better take control of the budget, monitor team members’ performances, and create a lively and competitive atmosphere. Livespace as a CRM do not just provide aftersales reports. It also enables companies to take measures in ensuring their profitability in the future through intuitive sales forecasting. With this, they are able to create plans, set budgets, and manage other resources in a much astute manner. Livespace is not just for individuals. It is for entire teams to work together in reaching the goals that have been set for them. By being a collaborative platform, each team member is aware of what is going on and can find ways that they can assist their colleagues when they are done with their own tasks. The application is also a platform for managers and team leaders to delegate responsibilities to their teams and ensure that they are done within the set deadline. Livespace also offers company management with statistics and relevant data as to how their sales teams are doing. This allows them to analyze the effectiveness of their strategies and pinpoint which one works best. Once they are able to identify it, they can leverage it, optimize it, and apply it to all. Livespace keeps all the information relevant to stakeholders in one place. These include phone call notes, sales arrangements, client offers, quotes, and more. Having these at hand makes sales representatives ready at any time to personalize each customers’ experience. Livespace is a team player as a CRM. It is able to connect with numerous tools and applications to enable users to work efficiently from one platform. There are popular and widely used systems in each software category. But are they necessarily the best fit for your company’s specific requirements? A popular software application may have thousands of customers, but does it offer what you require? For this reason, do not blindly spend on popular systems. Read at least a few Livespace reviews and think about the factors that you desire in the software such as the price, main functionality, available integrations etc. Then, select a few systems that fit your needs. Check out the free trials of these apps, read online opinions, get information from the maker, and do your investigation thoroughly. This exhaustive homework is sure to assist you find the finest software solution for your company’s unique requirements. How Much Does Livespace Cost? We realize that when you make a decision to buy CRM Software it’s important not only to see how experts evaluate it in their reviews, but also to find out if the real people and companies that buy it are actually satisfied with the product. That’s why we’ve created our behavior-based Customer Satisfaction Algorithm™ that gathers customer reviews, comments and Livespace reviews across a wide range of social media sites. The data is then presented in an easy to digest form showing how many people had positive and negative experience with Livespace. With that information at hand you should be equipped to make an informed buying decision that you won’t regret. What are Livespace pricing details? What integrations are available for Livespace? If you need more information about Livespace or you simply have a question let us know what you need and we’ll forward your request directly to the vendor.